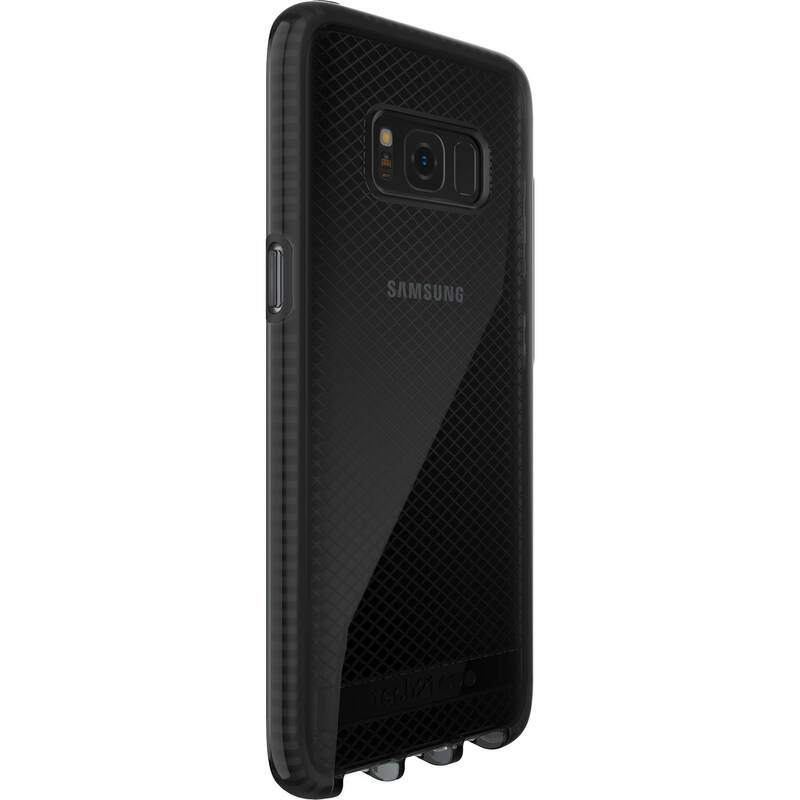 Protect your Galaxy S8 with the smokey and black Tech21 Evo Check Case. This case is made from FlexShock, a hybrid material that absorbs and deflects impact forces while resisting scratches. The raised bezel protects the screen when the phone is placed face down. Its translucent exterior is smooth with a checkered pattern. Box Dimensions (LxWxH) 7.6 x 4.4 x 0.8"
Evo Check Case for Galaxy S8 (Smokey/Black) is rated 4.8 out of 5 by 5. Rated 5 out of 5 by Manny from A match made in smartphone heaven I have been so attached to my LGG4 along with the Evo Tactile case they were all I ever wanted, though it was time to move on. As a new Samsung owner, I was not particularly excited with letting go of my LGG4 and LGv30, though the Evo Check case seems to become one with the Galaxy S8 while providing a sleek, rich look and enjoyable handling of my new device. The cutouts are perfect, and even the ones on the sides of the device for; Bixby, Volume up and down, and the Power button. It is a bit more flexible on the bottom at the charging port, though I believe this is Tech21s intended design. Rated 5 out of 5 by AM4290 from I love my tech 21 case My favorite company tech 21 My case feels good and it's not bulky like there brands it feels elegant. Rated 4 out of 5 by Lnavmiller from Replacement Recieved Thanks for honoring my replacement. It was delayed in customs but was finally recieved. Rated 5 out of 5 by mkrieg500 from Best Case Great looking case and it works great with the Tech21 Screen protector!